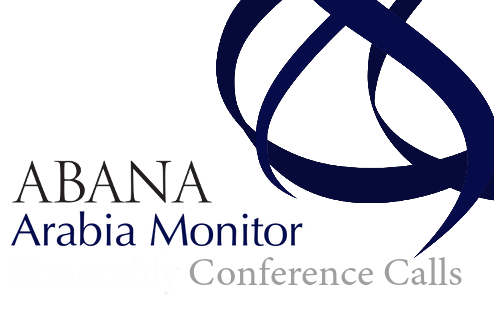 ABANA invites you to participate in our monthly conference call in collaboration with Arabia Monitor. How will the inclusion of GCC bonds in the JPMorgan EMBI index affect the region’s debt markets? We believe Saudi Arabia’s GDP growth will exceed the projections of the IMF (which has issued a downward revision). Why? Who are the main contenders for the April elections in Algeria so far? What factors could foster further political instability in the country? How significant will the issuance of green bonds be for Egypt and how will they compare to other issuers like Poland, France, Fiji and Nigeria? Who were the biggest winners and losers from the government formation in Lebanon? How pressing is Lebanon’s financial challenge? What is the likelihood of debt restructuring in 2019? What kind of projects is China developing in Algeria? Is Algeria receiving Chinese investments given its localisation initiatives? By RSVPing to this call you agree to provide your contact information to Arabia Monitor. Arabia Monitor may contact you directly following the call. The ABANA-Arabia Monitor Monthly Conference Call Series is led by Arabia Monitor’s CEO and Chief Economist Dr. Florence Eid-Oakden, a respected authority on the economy and geopolitics of the MENA region. Dr. Eid-Oakden is joined by a team of analysts to provide insights into emerging issues in and affecting the region. Calls are open to all ABANA members. *Please note that the title and content of the call are subject to change to reflect and include the most recent events affecting the region.